Lubiprostone is a locally acting chloride channel activator that enhances a chloride-rich intestinal fluid secretion without altering sodium and potassium concentrations in the serum. 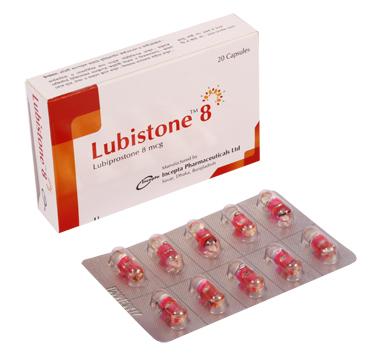 Lubiprostone acts by specifically activating ClC-2, which is a normal constituent of the apical membrane of the human intestine. By increasing intestinal fluid secretion, Lubiprostone increases motility in the intestine, thereby facilitating the passage of stool and alleviating symptoms associated with chronic idiopathic constipation. • Opioid-induced Constipation (OIC) in adults with chronic non-cancer pain. • Irritable Bowel Syndrome with Constipation (IBS-C). The recommended dose is 8 mcg twice daily orally with food and water. The recommended dose is 24 mcg twice daily orally with food and water. Dosage in patients with hepatic impairment: For patients with moderately impaired hepatic function, the recommended starting dose is 16 mcg twice daily. For patients with severely impaired hepatic function, the recommended starting dose is 8 mcg twice daily. Nausea: Patients taking Lubiprostone may experience nausea. Concomitant administration of food with Lubiprostone may reduce symptoms of nausea. Diarrhea: Lubistone should not be prescribed to patients that have severe diarrhea. Bowel Obstruction: In patients with symptoms suggestive of mechanical gastrointestinal obstruction, perform a thorough evaluation to confirm the absence of an obstruction prior to initiating therapy with Lubiprostone. It is not known whether lubiprostone is excreted in human milk. Because lubiprostone increases fluid secretion in the intestine and intestinal motility, human milk-fed infants should be monitored for diarrhea. 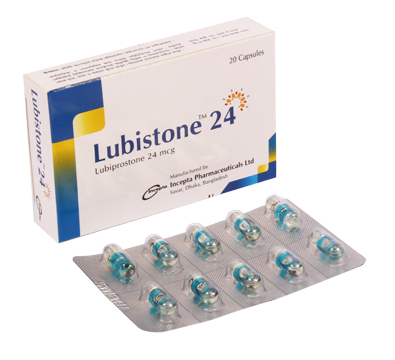 Caution should be exercised when Lubiprostone is administered to a nursing woman.